OK, Boston Celtics Fans, it is time to have a conversation that is not going to be very positive. The 2018 – 2019 Boston Celtics have issues and it is not one singular problem. I am going to cover this in steps and these steps are in no particular order. This team does not hustle. It waits and watches for someone else to do the work. Gordon Hayward is not ready for Prime Time. Kyrie Irving is often injured and is often running his mouth. Both of these items are negative short and long term. The young players that rocked during last years playoff run have sucked in finding new roles this season. Jason Tatum has flashes of greatness mixed with flashes of nothingness. The majority of these problems fall on the heads of Super Coach Brad Stevens and the God Like GM Danny Ainge. It was obvious early and often that Gordon Hayward is not ready and the Celtics organization failed at recognizing that reality. It was also obvious that the young players last year who rocked the NBA was struggling to find their place this season. These two issues should have been handled and addressed months ago. Now let’s hear from Marcus Morris after the ugly loss to the struggling LA Clippers Team. 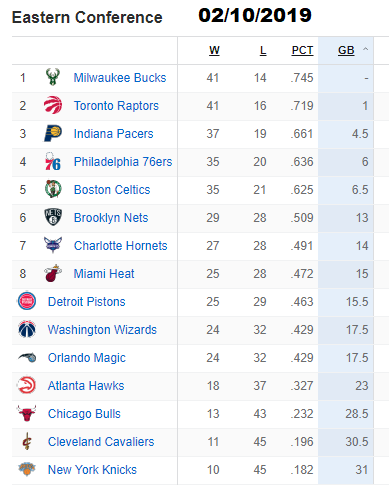 Sadly, the Raptors, 76ers, Bucks, and Hornets, are better teams that than current Celtics team. You could even say they are better coached. The team from outside of the playoff hunt you should watch is the Orlando Magic, who is playing well right now. It is going to be a struggle for this Celtics team to make the playoffs, nevermind being the #1 seed. To be honest, they may end up anywhere between the 6th and 8th seeding in the Eastern Conference. In the short term, changes have to be made. This team needs to create two different lines, using a hockey term. Team One is the starters who are going to get a certain amount of minutes, with the goal being under 30 minutes, with the mentality of using Kyrie Irving less, so he can stay remotely healthy for a playoff run. It is also a fantastic place to put Jason Tatum and focus on that player being the future star of this team. Then you can focus on the 2nd team players of Rozier, Hayward, and Brown, giving them an expanded role with expanded minutes. This will make these players happy because they will have a chance to highlight their particular skills and give Hayward more time to rehab and relearn the game. You also have to have a talk with Brad Stevens and get him out of his one-sided mindset. He does not adapt in-game and this inability to adapt is killing this team in key games. You cannot simply depend on Kyrie Irving staying with the Celtics or even being healthy enough to play for the Celtics. The NBA is littered with high-quality Guards. Kyrie Irving is one of the best Point Guards in the NBA. The key point is “one of the best”, you can still make moves next offseason to acquire a top guard. You do have options, Terry Rozier has ability, so does Jalen Brown. Simply, you can keep this an in-house issue regarding the Point Guard position. It is not a popular option, especially with the Boston Sports Media who does not know basketball. The funniest part is that they would not be able to name 5 other Point Guards who are equal too or even better than Kyrie Irving. NBA politics is an extreme item with a number of media clowns who talk nothing but nonsense, which will affect how you will acquire players in the offseason. Personally, the Celtics need to focus on a real Center. I am not talking about the Brow either. Boogie Cousins is going to want a Max Deal next season and a max deal will not be available at Golden State. Boogie Cousins is the right player for this Celtics Team. Combine him with Al Horford at Power Forward and Jayson Tatum at Small Forward, this Celtic Team would ROCK the EASTERN CONFERENCE. In this scenario, you do not need Kyrie Irving, Terry Rozier will be more than capable of delivering the ball to the new big three and would become an Assist King. Which would give you the option of using Brown and Hayward as an Off Guard Position? This 2018 – 2019 NBA Season is going to be very difficult for you Celtics Fans. So try to hang in and roll with the punches that are coming.